It was a wacky, wild, and downright weird week one in the NFL. I think this season is going to be a changing of the guard of sorts for some of the usual suspects that contend for a Super Bowl year in and year out. There are some risers and fallers, some movers and shakers in my week one power rankings. Check them out and let me know what you think! New England Patriots (1-0) – If you want to be the champs, you have to beat the champs. The Patriots weren’t perfect in their week one victory over the Steelers, but a late touchdown made the game look closer than it actually was. As long as Belichick and Brady are running the show, this team will be a favorite to reach the Super Bowl. Kansas City Chiefs (1-0) – I am really trying not to overreact to what I witnessed on Sunday, but this team is making it too damn hard. The Chiefs have spent numerous high picks on defense and it shows when you watch what I believe to be the best defensive unit in the NFL. They now have a formidable offense to go along with that monstrous D. Travis Kelce is a star and they now have a true number one wide receiver for Alex Smith in Jeremy Maclin (sorry, Dwayne Bowe). Green Bay Packers (1-0) – This team is certainly flawed (especially losing Jordy Nelson for the season) but as long as Aaron Rodgers is under center, they are a force to be reckoned with in the NFL. Bringing James Jones back (San Jose State, stand up!) to go along with Cobb and Adams already looks like a fantastic move. Cincinnati Bengals (1-0) – A week one win over the Raiders is nothing to write home about, but the Bengals looked damn good in doing it. The defense has been there, now Dalton seems poised to take the next step with his now healthy weapon at tight end. 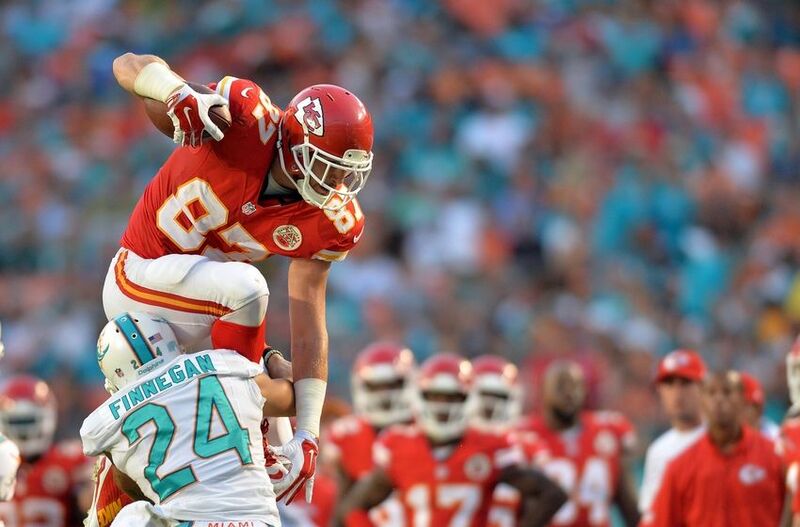 Like Travis Kelce in Kansas City, Tyler Eifert is going to help Andy Dalton take the offense to the next level. 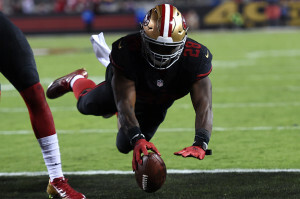 San Francisco 49ers (1-0) – This team is why I hate ranking teams in the preseason. The 49ers were supposed to be a dumpster fire this season based on the most tumultuous offseason we have ever witnessed. 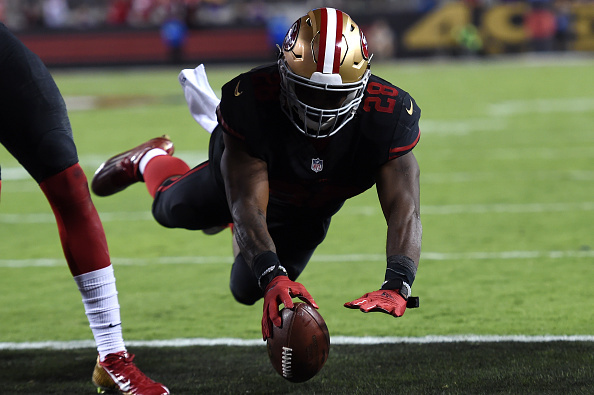 Carlos Hyde will be a workhorse at running back and acquiring Eric Mangini at defensive coordinator was one of the most overlooked moves of the offseason. I trust my eyes, and Jim Tomsula’s 49ers are no joke! 6. Buffalo Bills (1-0) – Tyrod Taylor made me reluctant to rank the Bills this high, but Rex Ryan went to back-to-back AFC Championships with Mark Sanchez at the helm. With a monstrous defense and a nice duo of running backs, this team has the potential to play deep into January. 7. Atlanta Falcons (1-0) – New head coach, Dan Quinn, had this defense looking much improved against the high powered Eagles on Monday night. Matt Ryan and Julio Jones might be the most lethal combo in the NFL along with the fellas in New England. 7-8-1 won the NFC South last year, but I think the Falcons will take the crown with a much better record this season. 8. Indianapolis Colts (0-1) – It’s time for the Colts to address the softness on the defensive side of the ball. They have the future of the quarterback position under center and will forever contend as long as Andrew Luck is leading the way. I look for them to bounce back after being trounced by the Bills in week one. Dallas Cowboys (1-0) – The loss of Dez Bryant, for what could be up to 12 weeks, knocked the Cowboys down my list quite a bit. Tony Romo still looked outstanding even without Dez for much of their week one matchup with the NFC East rival Giants. With the best offensive line in the NFL and a stable of running backs, I like Dallas a lot this year. San Diego Chargers (1-0) – It wasn’t pretty early for the Chargers week one against Detroit, but they came on strong in the second half. Philip Rivers has never looked great throwing outside of the numbers and now he may not have to with the weapons at his disposal. Keenan Allen looked like a star, Stevie Johnson is a great addition in the slot, Ladarius Green looks ready to make an impact, and they get Antonio Gates back in game five. They are deep at running back and former first round pick Melvin Ingram is healthy and going to bolster this defense. Denver Broncos (1-0) – It pains me to put Peyton Manning outside of my top ten, but I have to. 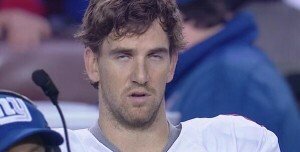 He will struggle against good defenses this year because they don’t respect his arm. I still think they’ll make the playoffs with a solid defense, but I do not think they are true Super Bowl contenders. Seattle Seahawks (0-1) – I believe Kam Chancellor will play this season and Seattle needs him desperately. They are weak on the offensive line and the NFC West is the worst division to play in if you can’t protect your quarterback. Despite their offensive line play I think their defense, Wilson, Lynch, and Graham are still strong enough to help them remain contenders. 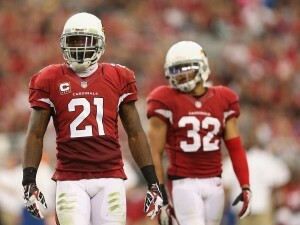 Arizona Cardinals (1-0) – This defense might be my favorite to watch in the entire NFL. The Cardinals essentially have five defensive backs on the field at all times highlighted by Patrick Peterson, Tyrann Mathieu, and Deone Bucannon. Carson Palmer looked spry in week one and the receiving corps he’s working with aren’t bad either. St. Louis Rams (1-0) – Aaron Donald, learn the name! The Rams defensive line is the best in the business with four first round draft picks starting on the unit in Donald, Robert Quinn, Chris Long, and Michael Brockers. Nick Foles certainly looked like a good fit in week one and it was just time for the team to move on from the frequently injured Sam Bradford. I can’t wait to see this team when Todd Gurley takes the field. Houston Texans (0-1) – There’s no shame in losing to the Kansas City Chiefs. JJ Watt and the Houston defense make them an interesting team. The Texans need to figure out who will be throwing the ball to star wide receiver, DeAndre Hopkins, moving forward. Ryan Mallett looked better than starter Brian Hoyer, but part of that might be due to the game being out of reach while he was in there. Baltimore Ravens (0-1) – This team always fines a way to be in the playoff mix; I can’t imagine this year will be any different. The loss of Terrell Suggs to an Achilles injury will no doubt hurt the Ravens, but they already signed Jason Babin to fill that void. Joe Flacco, Steve Smith Sr., and company will rebound from a rough week one against a stout Broncos defense. New York Jets (1-0) – Todd Bowles earned a win over the Browns in his head coaching debut. The defense looked as good as advertised. We should not write off Brandon Marshall just yet. If Chris Ivory can remain healthy, I like this team’s chances to compete; but I really wouldn’t bank on Ivory playing all 16 games. Philadelphia Eagles (0-1) – The offense got off to a shaky start in week one and newly acquired cornerback Byron Maxwell looks to have just robbed the organization blind. We know what Chip Kelly’s offense is capable of, but now it’s a matter of Sam Bradford staying healthy and finding a groove with all of his new toys. Carolina Panthers (1-0) – A win over the Jaguars does not do much for a team in my rankings. I’ve never been a big Cam Newton fan and I am even less of a fan with how depleted they are on offense. If Luke Kuechly misses significant time with his head injury, the Panthers will be in trouble. Pittsburgh Steelers (0-1) – It’s too easy to say that things would have been different if Pittsburgh had Bell, Bryant, and Pouncey last Thursday at New England. The fact is that they looked ill-prepared for week one and their defense is among the worst in the NFL. I expect a lot of shootouts in their future once all hands are on deck. Ben Roethlisberger and Todd Haley need to find some consistency on the road if they are going to make a push for the playoffs. Miami Dolphins (1-0) – A week one win doesn’t mean much against the Redskins when you have to be rescued late by a punt return for a touchdown. The offense, which loaded up on weapons in the offseason, looked pathetic. The acquisition of Ndamukong Suh did not pay immediate dividends as they allowed Alfred Morris to rush for 121 yards on 25 carries. I am just not convinced that Ryan Tannehill is very good. New Orleans Saints (0-1) – The Cardinals defense was not the ideal defense to go up against in the first game of the post Jimmy Graham era for the Saints. Brandin Cooks looked anything but spectacular in week one of his sophomore season in the NFL. As Drew Brees goes, so do the Saints. The defense and offensive weapons are not good enough for this team to make much noise in 2015. Tennessee Titans (1-0) – Marcus Mariota had a performance for the ages in his first ever NFL game with four touchdowns and a perfect passer rating of 158.3. The schedule is certainly kind to the Titans; they defeated Tampa Bay in week one and now have a date with Johnny Football and the Browns this Sunday. 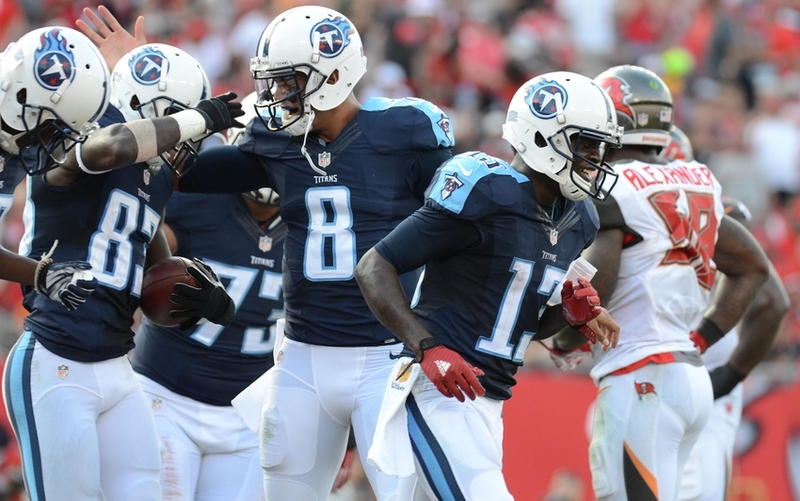 The Titans could ascend my Power Rankings rapidly if they show this type of performance again in week two. But for now, I have my reservations. Chicago Bears (0-1) – Jay Cutler and company did not look awful in their week one loss to Green Bay, but I still have no confidence in this team. Matt Forte looked quicker than he did at any point last season. I think John Fox will vastly improve this team’s consistency, but don’t think they have enough to compete with the big boys. Detroit Lions (0-1) – The Lions jumped all over the Chargers in the first half of their week one matchup behind an electrifying run by rookie running back, Ameer Abdullah. Up 21-3 midway through the second quarter, the Lions allowed the Chargers to rattle off 30 unanswered points in a 33-28 Chargers victory. Calvin Johnson does not look like the best wide receiver on Earth as he used to and the losses of Fairley and Suh in the offseason will certainly knock the defense down a peg or two. New York Giants (0-1) – Despite a narrow loss to NFC East rival, Dallas, I was not very impressed with the Giants. The offense looked downright awful in the preseason and continued the trend in week one. Eli Manning made the worst decision in the NFL when he threw the ball away late in the game instead of taking a knee which stopped the clock for the Cowboys, who were out of timeouts. Romo then led the Cowboys on a 6 play 72 yard drive in 1:27 for the game winning touchdown. Awful! Washington Redskins (0-1) – I expected the Redskins to look a lot worse with all of the distractions they faced this offseason surrounding RGIII. They did not look good by any means, but they were able to stay competitive against a Dolphins team that did not look ready for the start of the season. 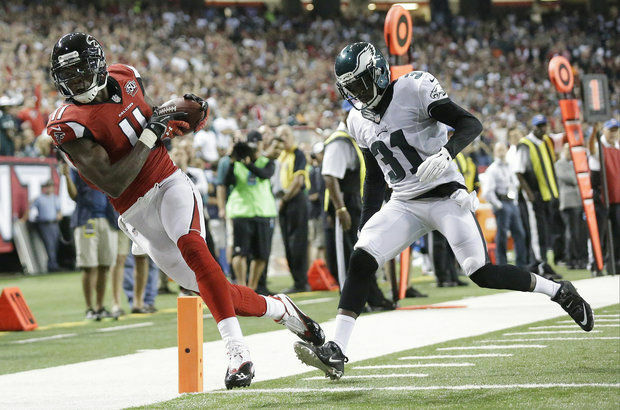 Big play wide receiver DeSean Jackson is already injured and will miss 3-4 weeks with a hamstring injury. Alfred Morris was the lone bright spot, rushing for 121 on 25 carries. Minnesota Vikings (0-1) – The Vikings looked shockingly bad. It seemed as though head coach, Mike Zimmer, and offensive coordinator, Norv Turner, forgot what Adrian Peterson is capable of. AP only touched the ball 13 times (10 carries and 3 receptions) for a total of 52 yards from scrimmage. That’s not the way to help out your second year quarterback, Teddy Bridgewater, who had 49ers defenders in his face all night. I won’t even mention what Carlos Hyde did to the Vikings defense. Cleveland Browns (0-1) – Josh McCown drove the Browns right down the field in their opening drive against the Jets, but then was concussed trying to do his best Johnny Manziel/John Elway impersonation on a scramble and dive at the goal line. Johnny Manziel replaced McCown and led the team to ten points on his first three drives before the Jets shut them out the rest of the way. There is a lack of weapons on offense and the defense is nothing to get excited about. The Browns are in for yet another disappointing campaign. Oakland Raiders (0-1) – There was a lot of hype about this team in the offseason, and boy did the Raiders do their best to kill the excitement in week one. I still believe Khalil Mack is going to be a star on defense, but there wasn’t much to be positive about in their week one loss at home to the Bengals. The good news is that Derek Carr’s injury doesn’t look like it will keep him out of their week two tilt with the Ravens in Oakland. Jacksonville Jaguars (0-1) – For the amount of times the Jags have picked in the top ten recently, they sure are devoid of talent. The team amassed three turnovers (one interception was returned for a touchdown), a missed field goal, a missed PAT. A 20-9 loss to the Panthers certainly isn’t the end of the world, but the Jags still seem destined for a disappointing season. Tampa Bay Buccaneers (0-1) – A 42-14 loss is always bad! The loss is even worse because the quarterback that they passed on with the number one pick in the draft (Marcus Mariota) came into their house and put up four touchdowns and a perfect passer rating while their new signal caller (Jameis Winston) had his first career pass intercepted and taken back for a touchdown. I think the league has passed Lovie Smith by. It’s going to be a long season for the Bucs.